Entering percussion notation is somewhat different to entering notation for pitched instruments (such as the piano or violin). However, it is recommended that you first read the chapter on Note input for pitched instruments before proceeding. When you create a percussion staff using the New Score Wizard or the Instruments dialog, MuseScore automatically choses the most appropriate staff type (1-, 3-, or 5-line) for the instrument: this can be changed, if required, using the "Staff type" column on the Chose instruments / Instruments page. Any additional changes (e.g. to a 2-line staff) can be made from the score itself (see Advanced Style Properties). On a 5-line percussion staff, each instrument is assigned a vertical staff position (line or space) and a notehead shape. For a drumset, one or two voices can be used. If the latter, voice 1 (the upper voice) usually contains (up-stem) notes played by the hands while voice 2 (the lower voice) usually contains (down-stem) notes played by the feet (see image below). Ensure that the MIDI keyboard is connected and functioning correctly. Note: If you click on the percussion staff without entering note input mode, you can demo the percussion instruments from the MIDI keyboard. Click on the note or rest where you want to start. Select the correct voice. For example, snares, sidesticks and all cymbals are normally added to voice 1; bass drum to voice 2. Press an instrument key to add a note to the score. To add another note at the same position, keep the first key held down while pressing the second key. Note: Refer to a GM2 drum map for details about which MIDI keyboard key corresponds to which percussion instrument. Some keyboards (e.g., Casio) display percussion symbols next to the keys as an aid to the user. Ensure that the Piano keyboard is displayed. Press P (or select it from the menu, View → Piano Keyboard). Note: If you click on the percussion staff without entering note input mode, you can demo the percussion instruments from the Piano keyboard. Click on a (virtual piano) key to add a note to the score. To add another note to an existing one, press Shift and hold it while pressing the new note (in versions before 2.1, use Ctrl (Mac: Cmd)). Note: Refer to a GM2 drum map for details about which piano key corresponds to which percussion instrument. Drag the panel downwards to the center and it will overlay the Drum input palette, full length. Both panels can then be accessed by Tabs. Drag the panel downwards to the right/left and it will dock to the right/left of the Drum input palette. Enter note input mode. The Drum input palette now appears at the bottom of the screen (see below). Select the desired note duration. Press the shortcut key (A–G) for the instrument that you wish to enter—refer to the Drum input palette window. If you wish to add another note to an existing one in that voice, press Shift + [A–G]. Note: Voice allocation is determined by the color of the note in the drum input palette: blue for voice 1, green for voice 2. Use the following method to add a new note or to replace an existing chord. Select the note or rest where you want to start. You can also select a measure. Press N to to enter note input mode. The Drum input palette now appears at the bottom of the screen (see below). Double-click a note in the Drum input palette. Select a note (e.g. Bass drum, or Snare) in the Drum input palette, then click a note or rest in the score. Ensure you are in note input mode. Select a note duration equal to the note you are adding to. Click on the new note in the Drum input palette. Click above or below the existing note in the percussion staff. When a percussion staff is selected and note input mode is ON, a window opens at the bottom of the screen called the Drum input palette. This window is essential for mouse input, and displays shortcuts for computer keyboard input, but can be ignored if using a MIDI keyboard or the virtual Piano Keyboard. Each note in the palette represents a percussion instrument: hovering the mouse pointer over the note displays the instrument name. The letters A–G (shown above certain notes in the palette) are designated as shortcuts for entering particular instruments (bass drum, snare, closed hi-hat etc. ), rather than referring to note pitches. They can be changed or reallocated as desired in the Edit Drumset window. 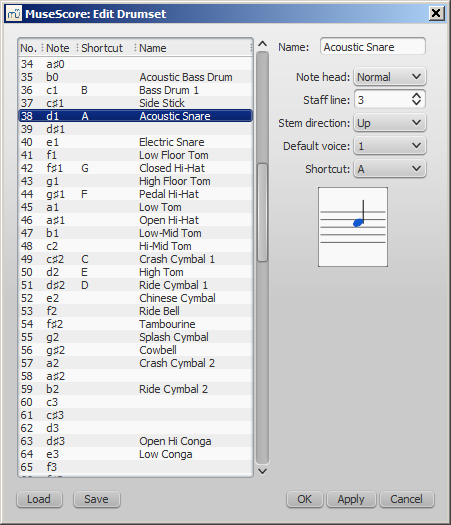 When the Drum input palette is open, double-clicking a note in the palette or entering a shortcut letter will add that instrument note to the percussion staff. The color of the note in the palette shows the voice allocated for that note—blue for voice 1, green for voice 2. This can be changed in the Edit Drumset dialog if required. This voice allocation applies only to keyboard and mouse entry of notes: entry via a MIDI keyboard or the virtual Piano keyboard allows any voice to be used. Click on the Edit Drumset button at the left of the Drum input palette. Right-click on a percussion staff and select "Edit Drumset...". The Edit Drumset dialog displays the percussion instruments available and the MIDI notes/numbers to which they are allocated. It also determines how each instrument is displayed on the staff— its name, position, notehead type and note-stem direction. Any changes made here are automatically saved in the parent MuseScore file. Name: The name you want displayed in the Drum input palette when you mouse over the note. Notehead: Chose a notehead for that instrument from a drop-down list of options (if set to "Invalid," the instrument will not display in the Drum input palette). Staff line: This number indicates the staff line/space on which the note is displayed. "0" means that the note is displayed on the top line of the 5-line staff. Negative numbers move the note upwards step by step, while positive numbers move it downwards in the same way. Stem Direction: Auto, Up or down. Default voice: Assign to one of four voices. This does not affect input from a MIDI keyboard or the virtual Piano keyboard. Shortcut: Assign a keyboard shortcut to enter that note. The customized drumset can be saved as a .drm file by pressing Save. You can also import a customized drumset using the Load button. Note: In MuseScore 2.1, some of the pitches in the Tenor Drums instrument do not play back; there is a DRM file designed to fix this, which you can download here, via right-click→ Save target as. To create a drum roll, use Tremolo.